A manufacturer of watches is looking for new measurement electronics that are suitable for a manual testing device as well as for a transportable solution for the measurement of the surface of gear wheels. Several points are to be measured. 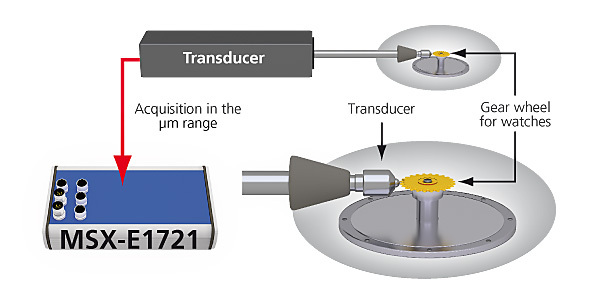 The existing transducers with µApp signals shall continue to be used as they are very expensive because of their high precision. The Ethernet length measurement system MSX-E1721 was specially developed for the acquisition with transducers with µApp signals. It allows to the watch manufacturer to smoothly integrate new technologies into his existing systems. The MSX-E1721 is compact and precise and thus well-suited for a portable use. As the transducers are controlled manually, the fast system MSX-E1721 must be set in a way that the reference point is quickly found. A LED indicates whether an acquisition is running on the incremental input or not. The Ethernet system is available for years and thus meets the requirement of the watch manufacturer for long-term availability.